A lot of us have a tendency to indulge in a whole lot of sweet and not so lean treats during the holidays that after a while may feel like a sugar overload. I certainly love my carbs and sweets and I’ll never give them up–but after a while I too find myself craving leaner foods with fresh ingredients that leave you feeling full but not bloated or lethargic. Usually when I get those cravings, I go to particular cuisine: Mediterranean. Apart from soul food, if I had to pick a cuisine to eat for the rest of my life it would definitely be Mediterranean/Lebanese. I’m addicted to so many things about it: the fresh ingredients, the bright, zesty seasoning and spices, the satisfaction it brings to my belly without making me feel guilty if I ate a lot of it. It’s just the best. I’ve shared a few of my favorite Mediterranean dishes on the blog already, and I highly recommend that you check them out, as they’d make a good accompaniment to the dish I want to share with you guys today. No, I mean it. Chicken Shawarma and Roasted Red Pepper Hummus, stat. They’ll change your life. My ‘must-haves’ for a Mediterranean meal include a plate of chicken shawarma, hummus and falafel. It’s the perfect trio. I hope to God that you know what falafel is, but on the most outrageous of off chances that you don’t…it’s a mixture of ground chickpeas, veggies and spices that are mixed together and then usually deep fried until crispy on the outside. I say ‘usually’ because I’ve recently found that falafel doesn’t always have to be fried to taste good. The base ingredients for traditional falafel are still here: you’ve still got your chickpeas, parsley, lemon juice, cilantro and garlic. I also added in plenty of cumin and smoked paprika with some other spices that I thought complemented the others well. I do recommend that you allow the mix to sit in the refrigerator overnight for two reasons: first, the colder it is, the more time it has to firm up and be easier to shape into patties. Second, it allows the flavors to marinate and develop into the beans. The process of cooking the falafels is simple. After shaping them into patties, they get a quick sear on the stove, then a few minutes in the oven.From there, you can do whatever you like with them; eat them as a sandwich on a bun, stuff one into a pita, crumble them up into a salad, or even just eat it all on its own dipped in hummus. All of these are good choices. I am most definitely not a vegetarian and it’s very safe to say I will never become one. I love poultry too much to do that. However! I will say that for several days I ate falafel patty sandwiches and found myself uncharacteristically not missing the meat. The garbanzo beans give the patty a ‘meaty’ texture and the fiber in them fills you up in an even better way than meat because your stomach doesn’t feel as heavy. These are really good and I think they’d be a nice way to start the year off if you’re in need of a lighter meal. Linking this last post of 2017 up to Fiesta Friday #204, co-hosted this week by Sandhya @ Indfused.com. Place the chickpeas in a bowl of cold water, cover and refrigerate for 24 hours or at least overnight. Drain well. They’ll expand to about 4 cups. Place 2 cups of the beans in a food processor (or blender). Pulse a few times, then process until a smooth paste. (If the mixture is too chunky, add about 2 tablespoons of water to the food processor or blender to make it smoother). Remove to a small bowl, then pour in the other half of the beans. Pulse these a few times until they are mostly chunky—they don’t need to be as smooth as the first batch, it’s alright if there are some large bits still in there. Remove the second batch of processed beans with the first to the bowl. Place the herbs, lemon juice, spices and baking powder in the processor and process thoroughly. Pour the chickpeas back into the processor and process mixture all together. (If too thick and ‘dry’ to hold together, add a couple tablespoons more of water. If need be, you can also do this in batches, then mix it all together in a bowl afterwards). Refrigerate the falafel mix overnight to allow it to firm up and for flavors to fully develop. Scoop the falafel out with about heaping 1/3 cup measure, then shape into patties. Refrigerate patties for 30 minutes. Heat 2 tablespoons of oil in a skillet or Dutch oven over medium heat. Add three patties to the pan, then cook for about 6 minutes per side. Remove to a wire rack that you place over a sheet pan. Repeat frying process with your remaining patties and oil until finished. Preheat oven to 350 degrees. Bake the patties in the oven for an additional 10-15 minutes before serving on toasted hamburger buns or inside/alongside pita bread. I love me some falafel! These look great! So excited to try this recipe! 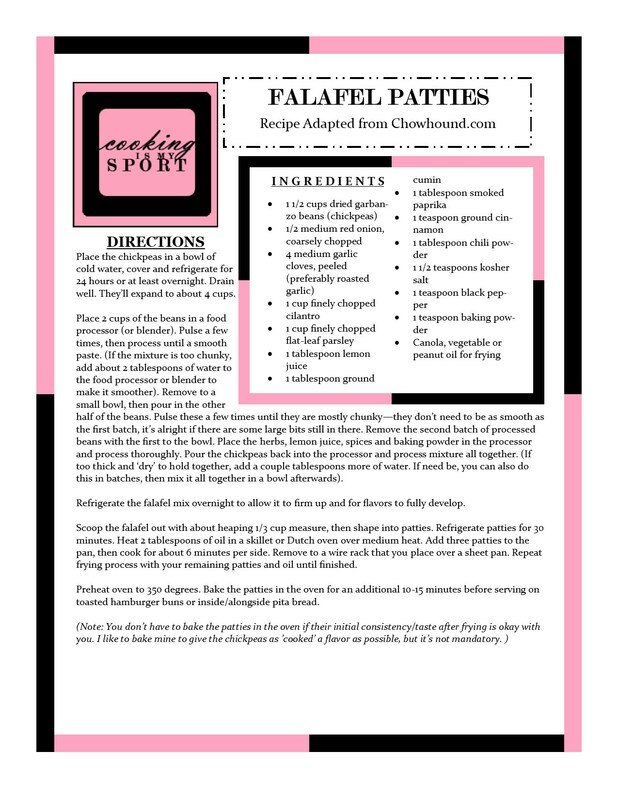 I usually buy falafel but your post makes me want to make it myself! I usually buy them too Ashley, but this is a less labor intensive way of making them for myself. Thank you! I’ve never had falafel but yours looks really good! There’s a place nearby I can order them too. Happy new year! Oh my goodness! You really MUST try falafel. You can buy it first for the first time and once you do I *promise* that you’ll want to try and make it yourself. Thank you! Ok. I’ll let you know when I try it! Lol! I have never eaten a falafel or made one or even seen one in person. BUT I have heard of them!! So, if I am being totally honest…they aren’t the most beautiful thing I’ve seen, but they sound like they could be good!! It’s true, they’re not the prettiest things to look at, but I do guarantee that they’re delicious. Thank you Abbey. Love falafel, but I do not love making little balls and frying them!! Great idea, Jess, and your falafel mixture sounds incredible! Jess, these falafel patties look absolutely scrumptious. We are huge fans of falafel too. I am drooling over your falafel patty pics!Thanks for sharing it with us at Fiesta Friday! Happy 2018! I love chickpeas and falafels and these patties look really delicious! I love Falafel, so I wouldn’t turn down this one! 😀 They look so yummy, Jess. Happy new year! Thanks, I hope you can try it sometime.